Tendinopathy is now the term of choice for the clinical condition following overuse injury. The terms tendinosis and tendinitis are histopathological descriptions and should not be used without microscopic confirmation. Overuse tendon injuries cause pain, reduce strength and function, and decrease tolerance and length of exercise. The Achilles tendon and posterior tibial tendon are among the most common areas affected by tendinopathy in runners. Surgical specimens taken from patients with well-established tendinopathy show little to no signs of inflammation. Instead, the specimens show hypercellularity, an increase in proteoglycan content, vascularization, and a loss of the usual tightly bundled collagen appearance. Tendinopathic tissue is usually grey or brown in color. Physically the tissue is soft and fragile. Animal preparations do not demonstrate inflammation as a component of long standing tendon injury. Inflammation is only seen in cases of acute and extreme tendon loading. The microscopic pathology of both mid-tendon and enthesis injuries is histologically similar. Repetitive overload and microtrauma can occur in conjunction with non-uniform stress within a tendon. The result is local fiber degeneration. A single abnormal loading cycle (e.g. a misstep) could be enough to create isolated fibril damage. The patient would not likely recall a specific injury. Neer believed impingement could be a cause of tendinopathy in the supraspinatus tendon below the anterior margin of the acromium. (Neer 1983) An analogous process may contribute to peroneus longus tendinopathy adjacent to the cuboid bone. Magnetic resonance imaging (MRI) and diagnostic ultrasound (US) are the most frequently employed diagnostic procedures. In contrast to tenography, both of these procedures are non-invasive and cause no further to damage to the tissues. US is a fast and inexpensive technique which can be performed in an office setting. Tendon thickening, echogenic changes around the tendon, and adhesions are readily seen. Tendons affected by tendinosis, on US examination, show low reflectivity peripherally. In chronic tendinosis, peritendinous adhesions are seen as a hypoechoic paratenon with poorly defined borders. MRI using relatively small spaced images provide greater detail, but takes longer to perform and is considerably more expensive. In this zone, too many injuries are often called “plantar fasciitis.” At the lateral corner of the “zone of confusion” injuries to the cuboid, os peroneum, peroneus longus are often misdiagnosed as the nebulous “cuboid syndrome”. Also in this "zone of confusion" there are several midfoot tendons that are often injured but not considered in the diagnostic process. We will pay special attention to the peroneus longus tendon and the flexor hallucis longus tendon. These two tendons along with the insertion of the posterior tibial tendon and the mid portion of the plantar fascia, sit in what I call in this article the “zone of confusion”. A high level of suspicion combined with careful examination should lead to the proper diagnosis. Treatment failure often follows a failure to make the correct diagnosis. Diligence in creating a reasonable set of differential diagnoses should be done for each patient. Careful examination, consideration, and imaging when necessary will minimize diagnostic errors. The plantar midfoot can be an area of consternation. Classically, the midfoot includes the navicular, cuboid and the three cuneiform bones. It lies anterior to Choparts joint which includes the calcaneocuboid and talonavicular joints. Our zone of confusion extends within the soft tissue a bit distal to this. Many times pain in this area is mistakenly ascribed to plantar fasciitis or plantar fasciopathy. Perform a painstakingly careful evaluation of this area while keeping in mind the structures you are palpating. Specifically, trace and palpate the Peroneus longus tendon, flexor hallucis longus tendon, and the insertion point of the posterior tibial tendon. Any of these tendons could cause symptoms that mimic plantar fasciopathy. We’ll focus on these clinical entities, but you should keep in mind more dorsal structures that could contribute to pain in this area including: Lisfrank ligament or joint injury, metatarsal stress fracture, cuboid stress fracture, navicular stress fracture, and plantar fascia tear. P.T.–Insertion of posterior tibial tendon. The posterior tibial tendon (PTT) runs behind the medial malleolus in a fibro-osseous groove and inserts primarily into the navicular tuberosity but also into the cuneiform bones. In the athletic population overtraining and excessive pronation of the foot are risk factors. MRI can be an adjunct to diagnosis and to recognition of tears in the tendon. The spring ligament (plantar calcaneonavicular ligament) is a static structure, but functions in tandem with the posterior tibial tendon. An injury to the spring ligament would usually be found only in conjunction with an injury to the PTT. The MRI would show the ligament to be abnormally thickened and would demonstrate an increased signal intensity. Previous articles have discussed posterior tibial tendon dysfunction in detail. The os peroneum is a sesamoid bone found within the peroneus longus tendon. It is usually located just proximal to the cuboid tunnel. This bone is thought to be present in the majority of people and a corresponding facet is found in the cuboid 93% of the time. The os peroneum is often only partly ossified or fibrocartilagenous. It is visible on x-ray only 5% of the time. In conjunction with an inversion injury and tenderness at the cuboid the os peroneum is often a contributing factor in lateral foot pain. This bone can traumatically fracture. In the presence of a painful os peroneum the MRI often shows signs of tendinopathy of the peroneus longus tendon, along with peritendinopathy, and bone marrow edema of the cuboid. (Sobel M 1994) Sclerosis and fragmentation of the os peroneum after chronic pain have also been found. Clinically, always examine patients with lateral foot or plantar midfoot pain for tenderness along the plantar course of the peroneus longus tendon. It appears to be a structure that is often injured. The first step in diagnosis of a distally injured peroneus longus tendon is suspicion of the injury. After determining that there is a likely peroneus longus injury, direct your attention to the lateral ankle. Tenderness of the lateral ligaments is a confirmatory sign of inversion injury. Often the inversion injury does not appear major and tenderness is only seen at the anterior talofibular ligament. An MRI can be of assistance and prevent a mistaken diagnosis of “cuboid syndrome”. Longitudinal tears of the peroneus longus tendon at or proximal to the cuboid tunnel can often be treated with immobilization. If these tears fail to heal, excision of nonviable tissue and suturing may be performed. An enlarged peroneal tubercle should also be removed. Look to see if a peroneus quartus inserts into the tubercle. Complete peroneus longus tendon tears occur most often at the cuboid tunnel, sometimes in conjunction with an os peroneum. The os peroneum can retract proximal to the calcaneocuboid joint when the distal tendon is torn. If an end-to-end repair is not possible, one may either perform a tenodesis to the peroneus brevis or alternatively attach the longus to the cuboid. Follow the link for more information on injury and rehabilitation of the Peroneal Tendon Complex. “... A high level of suspicion combined with careful examination should lead to the proper diagnosis. Treatment failure often follows a failure to make the correct diagnosis. ..."
The flexor hallucis longus is a multijoint muscle which plantar flexes the hallux, contributes to resisting pronatory forces and is a weak plantar flexor at the ankle, although in the ballet dancer it is the important force transfer link in attaining the point position. Flexor hallucis longus (FHL) tendinopathy is known to be a frequently encountered injury among ballet dancers. 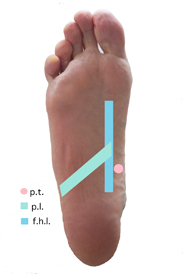 In ballet dancers FHL tendinopathy can be found in association with a symptomatic os trigonum. Scattered reports exist of injuries to this tendon in runners. (Coghlan and Clarke 1993) Olaff, in a study of non-athletes noted that this is likely an underreported injury. (Oloff and Schulhofer 1998)Most authors have found that the majority of the injuries to this tendon to take place proximally, with some tears occurring at the level of the hallucal sesamoid bones. Tenography may be an accurate indicator of injury to this tendon, but is no longer widely used. Physical examination, MRI, and diagnostic ultrasound could be useful in the diagnosis of this clinical entity. Physical examination will reveal tenderness along the course of the FHL tendon. Limitation of dorsiflexion of the hallux may be found. Pain may be elicited by dorsiflexion of the hallux or dorsiflexion at the ankle. FHL tendinopathy has been found in conjunction with plantar fasciitis. (Michelson and Dunn 2005) Upon questioning, the patient will often reveal that they have been performing vigorous dorsiflexion exercises of the toes and hallux in attempting to “stretch” the plantar fascia. Conservative treatment is often useful and yields excellent results in the plantar midfoot. Dorsiflexion exercises of the great toe and vigorous over stretching of the Achilles tendon should be discontinued. Short term immobilization may be necessary. Eliminate over cushioned and excessively flexible shoes. Following weaning from a cam walker or pneumatic walker, begin soleus and gastrocnemius stretching and strengthening. Recommend a running shoe that is a good match for the patient’s individual biomechanics. Follow up exercises after resolution of symptoms should include gentle calf stretching, toe curls to improvement intrinsic muscle function, and wobble board exercises to develop ankle strength, stability, balance and proprioception. An orthotic as described below is often helpful. The surgical treatment described includes debridement, tenolysis, decompression, and excision of a symptomatic os trigonum. The reported surgical results for proximal injuries have been excellent. (Michelson and Dunn 2005; Hamilton 2008) The patient should be kept non-weightbearing for two to three weeks. Begin gentle hallux range of motion exercises at 7 days. Following the non-weight bearing time period, transition to pneumatic walking boot for two weeks, then wean the patient from the pneumatic walking boot. The orthotic planning begins with a proper cast. For polypropylene shell orthotics, an off weightbearing plaster casting technique should be used. The midtarsal joint should be maximally pronated while the subtalar joint is held in neutral. Forefoot supinatus should be eliminated by plantarflexing the first ray by applying a plantar flexion force on the dorsal aspect of the first metatarsal head. (Sometimes mild dorsiflexion of the hallux can assist in creating a mild plantarflexion of the first ray.) An intrinsic forefoot post needs to be used with this casting technique. The Features of an orthotic prescription should include a forefoot valgus extension below the second through fifth metatarsals (approximately 3 degrees), a flat and stable rearfoot post with no rearfoot post motion grindoff ( 0/0 at some labs), a lateral heel skive (Kirby), no beveling of the lateral aspect of the rearfoot post and cast balancing using a vertical or slightly everted cast pouring. Moderate cast fill is usually used, but consider minimal cast fill for better conformation to the foot shape and contours. Direct milled orthotics can be helpful in providing stability. A 3 mm to 5 mm heel lift can also be helpful in reducing the tension in the peroneal tendons. The rationale for this prescription is first to decrease supinatory moments (in layman's or simplified terms - rotational forces) at the rearfoot (STJ). Secondarily the stability of the rearfoot post combined with the diminished supinatory moments will both decrease tension within the tendon and also prevent a sudden inversion which will create a stretch and stretch response reflex. We have reviewed several troubling injuries. Diagnosis is the key to successful treatment of injuries. Careful assessment and review of differential diagnoses should lead to the proper diagnosis. Regular critical review of the available literature will keep your knowledge up to date. Successful diagnosis and treatment of your patients is the first step towards overall success. Bains, S., Porter, K (2006). "Lower limb tendinopathy in athletes." Trauma 8: 213–224. Beloqui, A., Guazzaroni, M., Pazos, F. , Vieites,J. (2009). "Reactome Array: Forging a Link Between Metabolome and Genome." Science 326(October 9): 252-257. Coghlan, B. A. and N. M. Clarke (1993). "Traumatic rupture of the flexor hallucis longus tendon in a marathon runner." Am J Sports Med 21(4): 617-618. Cook, J. L. and C. R. Purdam (2009). "Is tendon pathology a continuum? A pathology model to explain the clinical presentation of load-induced tendinopathy." Br J Sports Med 43(6): 409-416. De Moor, M., Y. J. Liu, et al. (2009). "Genome-Wide Association Study of Exercise Behavior in Dutch and American Adults." Med Sci Sports Exerc. Eisenmann, J. C. and E. E. Wickel (2009). "The biological basis of physical activity in children: revisited." Pediatr Exerc Sci 21(3): 257-272. Hamilton, W. G. (2008). "Posterior ankle pain in dancers." Clin Sports Med 27(2): 263-277. Iglehart, J. K. (2006). "The new era of medical imaging--progress and pitfalls." N Engl J Med 354(26): 2822-2828. Jozsa, L. and P. Kannus (1997). "Histopathological findings in spontaneous tendon ruptures." Scand J Med Sci Sports 7(2): 113-118. Jozsa, L., Kannus, P (1997). Human Tendons: Anatomy, Physiology, and Pathology, Human Kinetics. Michelson, J. and L. Dunn (2005). "Tenosynovitis of the flexor hallucis longus: a clinical study of the spectrum of presentation and treatment." Foot Ankle Int 26(4): 291-303. Mokone, G. G., M. Gajjar, et al. (2005). "The guanine-thymine dinucleotide repeat polymorphism within the tenascin-C gene is associated with achilles tendon injuries." Am J Sports Med 33(7): 1016-1021. Mokone, G. G., M. P. Schwellnus, et al. (2006). "The COL5A1 gene and Achilles tendon pathology." Scand J Med Sci Sports 16(1): 19-26. Neer, C. (1983). "Impingement lesions." Clin Orthop Relat Res 173: 70-77. Oloff, L. M. and S. D. Schulhofer (1998). "Flexor hallucis longus dysfunction." J Foot Ankle Surg 37(2): 101-109. Schulhofer, S. D. and L. M. Oloff (2002). "Flexor hallucis longus dysfunction: an overview." Clin Podiatr Med Surg 19(3): 411-418, vi. Slater, H. K. (2007). "Acute peroneal tendon tears." Foot Ankle Clin 12(4): 659-674, vii. lateral foot pain." Foot Ankle Int 15((3) March): 112-124. Ting, A. Y., W. B. Morrison, et al. (2008). "MR imaging of midfoot injury." Magn Reson Imaging Clin N Am 16(1): 105-115, vi. Xu, Y. and G. A. Murrell (2008). "The basic science of tendinopathy." Clin Orthop Relat Res 466(7): 1528-1538.